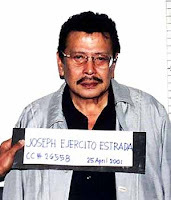 Ousted Former President Joseph "Erap" Ejercito Estrada made his announcement the other day about him running again for presidency this May 2010 election. To those who didn't know, he was convicted of corruption after being ousted in a popular uprising in 2001. I couldn't help but smirk as I was listening to his speech. “This is the last performance of my life and I will not fail you,” Estrada said in front of the cheering crowd in Tondo, Manila, where he announced his plan to run in the 2010 elections, with Makati Mayor Jejomar Binay as his running mate. Yeah right. He is definitely running despite his age, huh? He said he was confident of winning on May 2010 elections during his interview in Magandang Umaga Bayan, a morning show in ABS-CBN. And that he's eligible of running as president in May 2010 despite the election ban against him by Malacanang. He's actually babbling and all during the interview. It felt like he's going to have a stroke anytime soon! Lol! He's more than 70 years old now and people doubt if he can make it to the election. I personally don't like him even before he was the president. And hearing him talk make me sick. I definitely don't want a babbling president. Not at all! why do people won't learn from the mistake they had before? what's with him that makes all these senator encourage him to run for a president again????? That's what I don't understand either NovaS. Lol! Let's just hope he won't win the next election.